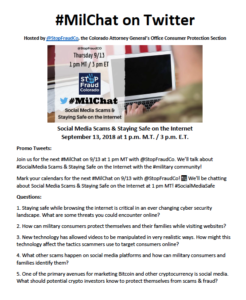 Below is our 2018 #MilChat topic schedule. The chats will be held on the 2nd Thursday of each month at 1:00 pm MT / 3:00 pm ET. November – Surviving the Holidays! Please reach out to me if you have any suggestions, questions, or need any assistance. We look forward to tweeting with you! Thanks again and have a Happy Start to Fall!